Middleweight Martin Saldana knocked veteran Joan Jose Valenzuela out in round three late Friday night at the Quiet Cannon in Montebello, California. The taller Saldana (10-0, 5 knockouts) rained punches down on Valenzuela, who attempted to get on the inside of Saldana’s long reach. The 21-year-old Saldana of nearby North Hollywood continued to overwhelm Valenzuela in the second and third rounds. Valenzuela was not visibly hurt from the punches, but attempted to cover up as Saldana mounted a series of attacks. A combination to the head of Valenzuela prompted referee Zachary Young at 1:33 of round three. 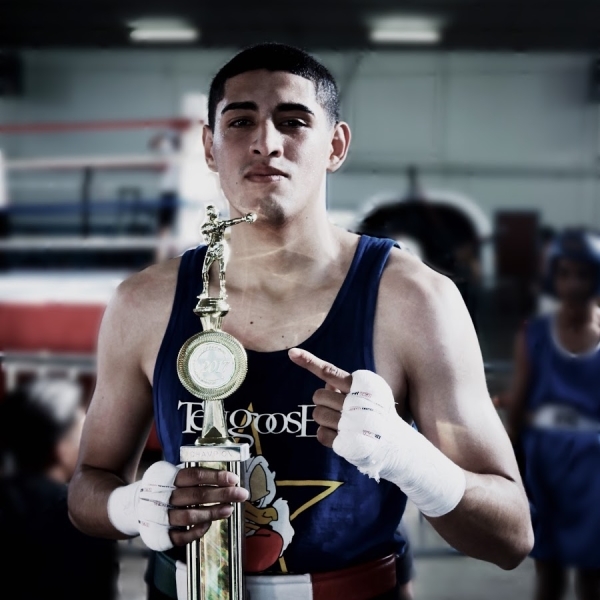 Valenzuela, who is originally from Tijuana, Mexico and now resides in Bakersfield, California, falls to 5-13-2, 5 KOs. In the co-feature bout, lightweight Michael Norato remained unbeaten, defeating Luis Gerardo Avila (8-17-3, 5 KOs) over six one-sided rounds. All three judges scored the bout 60-54 in favor of Norato, who improves to 7-0, 2 KOs. Junior lightweights Roger Gutierrez and Mexico’s Emmanuel Castro fought to a split-decision over six rounds. Gutierrez (7-3-2, 4 KOs) was the more-effective fighter during the first two rounds of the fight. The southpaw Castro (2-5-1, 2 KOs), with WBA junior featherweight titleholder Danny Roman in his corner, connected with several left hands to the head during the second half of the fight. Each fighter won 59-55 on a judge’s scorecard, while the third judge scored the bout 57-57. Welterweight Jhon Sanchez Leon knocked out David Morales in the opening moments of the fourth round. A cut opened over the fight eye of Morales (2-3-1) within the first minute of the opening round. Blood oozed out of the cut, making it difficult for Morales to see. Both fighters stood in the pocket, with Sanchez Leon (6-1-1, 4 KOs) landing the more-telling punches. Morales’ left eye began to swell and, by the end of the third round, was completely shut. The fight was stopped at 2 seconds into the fourth round as the ringside physician advised referee Rudy Barragan to stop the fight. Junior middleweight Vardges Vardanyan of nearby Panorama City defeated veteran Tavorus Teague by unanimous decision over four rounds. The southpaw Vardanyan closed the distance between the two fighters, initiating exchanges and connecting left crosses and right hooks to the head of Teague (6-25-4, 3 KOs). All three judges scored the bout 40-36, 40-36, and 39-37 for Vardanyan, who improves to 6-0, 1 KO. The two fighters squared off six weeks before, a fight Vardanyan also won by unanimous decision. In junior lightweight action, Alexis De Luna (4-0, 3 KOs) defeated veteran Daniel Bastien (4-12, 1 KO) by unanimous decision. All three judges scored the bout 39-37 in favor of De Luna. All Star Boxing Promotions, which is run by Ed Holmes, promoted the card.